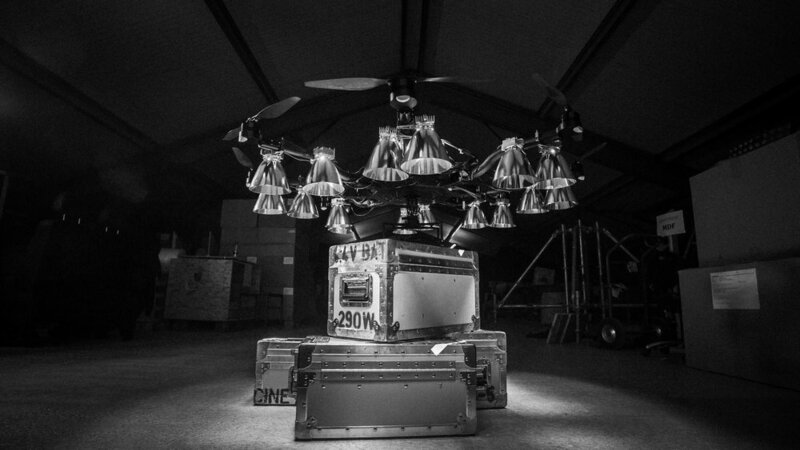 BROOKLYN AERIALS is one of the leading drone lighting companies. All of our lights are using high CRI, high quality LED chips and each unit is stabilized with Freeflys MoVI to guarantee smooth light movement or perfectly static illumination. 400W LED Spot: High CRI, Daylight balanced. This light provides a very focused beam of light and uses 4x parabolic reflectors. Stabilized by our MoVI PRO this light is fully remote controlled and uses a HD FPV camera for accurate light positioning. 600W RED LED Spot: deep red LED w/ 6x parabolic reflectors. Stabilized with MoVI PRO. 900W LED Soft Light: 98 CRI, Daylight balanced. This light is our big source to light up large areas. MoVI stabilization allows for a very steady or static light without transferring wind or drone movement into the light. 1,600W LED hard mounted with parabolic reflectors. The worlds brightest drone light, optimized for maximum overhead output. MAXABEAM High Powered Xenon Spotlight w/ flood control.